We needed a shuttle for a canoe trip on the White River. No problem! We called and Art picked me up within 10 minutes. No matter what is needed, both Amy and Art are happy to help. This was our second stay at Arkansas White River Cabins, and we will come again. The cabins are spotless, Art and Amy are wonderful owners and hosts. The view from any cabin's vantage point is spectacular! We find it to be the best place in Eureka Springs to relax and unwind. 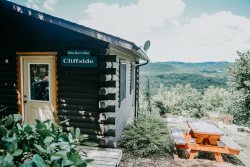 The views are breathtaking and our "Cliffside" cabin had everything we needed!! Both Amy and Art were very friendly and made us feel welcome. All in all it was great. Only feedback would be since the deck faces the west it would be nice to have a shade to pull down or a ceiling fan. Other than that pure awesomeness. Art and Amy are both very friendly and helpful. They have great recommendations and are knowledgeable about the area and great places to go! This is our second visit to White river cabins and we couldn't be more pleased. The cabins are beautiful, have all the right ammenities, extremely clean and are so comfortable you never want to leave! We loved the new addition of the Bulletin boards with a map and ideas of places to go! We were able to find great things to do for our anniversary trip this past weekend thanks to this information provided! We will surely be making reservations with White River Cabins again soon!! We love it!! Great vacation spot with an amazing view. The cabin had everything we needed for cooking for the week and relaxing after going out hiking, biking, and kayaking. We were late checking in and someone was waiting for us, made the check-in process as easy as could be. I needed a special cooking pot and again in a flash one was at our door. Though it's been a few years, we've been coming to White River for maybe 20+ years. The site is convenient and somewhere between beautiful and breathtaking. The cabin updates make it even more comfortable and increase the value. Eureka Springs is a very special place for us and White River Cabins an important part of these experiences. I really appreciate small touches like the kitchen being equipped with a great set of chef's knives, and my wife went crazy over the quality of the bed sheets. I'm surprised that she didn't take them along with us. Another great piece was the skylight over the comfortable bed. Imagine laying on fine sheets,a comfy mattress and being able to watch the incredible star show. Finally, there's the almost nightly fog show. We've been to a lot of beautiful places, and the sight of the evening fog rising up, filling the White River Valley from river to mountain tops and then burning down in the morning is pretty close to being enough reason for us to travel the almost 1200 miles from Richmond.